Born in San Juan de los Lagos, Jalisco, María Izquierdo married a militia man when still very young. When she was mother of two children she separated from her husband and moved to Mexico City. She enrolled in the National School of Fine Arts, where she studied under the painter Germán Gedovius. 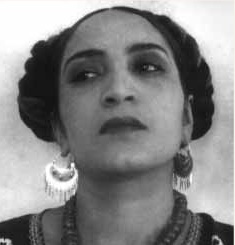 She had her first individual exhibition in Mexico City in 1929 and shortly afterward showed her work in the Arts Center of New York. This year, Izquierdo became involved with Rufino Tamayo, and for four years hey were companions and shared a studio. With their many correspondences and cross influences, the works produced by Tamayo and Izquierdo in the late 1920s and early ´30s attest to a close professional relationship. Both portrayed stll lifes, portraits and nudes. Their color palettes were also similar. Tamayo shared his skills with Izquierdo and also taught her how to use the watercolor medium. In 1936 she embraced some principles of surrealism, because of her friendship with the poet Antonin Artaud who was on a visit to Mexico at the time. She easily shaped her path under the influence of avant-garde ideas and the main trends of popular culture. She devoted herself to art criticism. As a woman artist she suffered because of the monopoly of the muralists Diego Rivera and David Alfaro Siqueiros, who systematically blocked her efforts to paint murals in Mexico City. She died on December 3rd, 1955.